Christmas crack is a holiday favorite in my family. 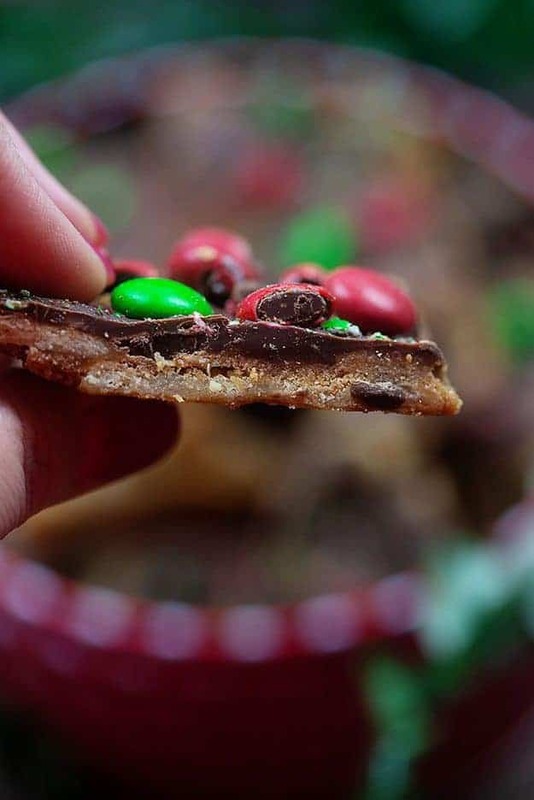 It starts out with saltine crackers and homemade toffee and gets topped off with colorful m&m candies! This one is perfect for adding to your cookie trays during the holiday season. There are some recipes that we make every. single. Christmas. No matter what. I’m sure your family is the same way! We all have our favorites and it’s just not the holidays until you’ve made everything on that list, you know? 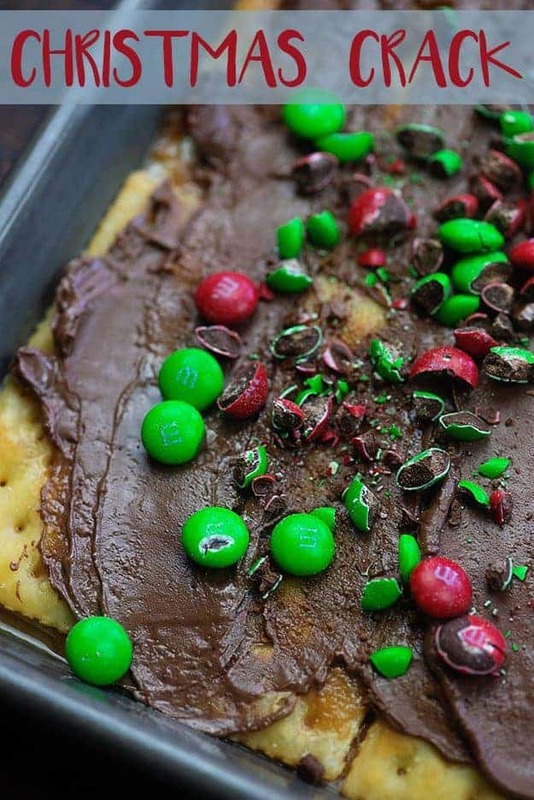 This Christmas crack candy is one of those recipes for us. I first started making this when my kiddos were little and it’s been a staple on every holiday cookie tray I’ve put together since then. 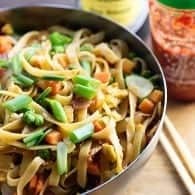 This is one of those super easy recipes that takes no time at all to make! The hardest part is waiting for the toffee to cool and harden. Promise. 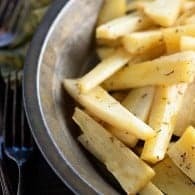 To start, you’ll want to line a baking sheet with parchment paper and then fill it with a single layer of saltine crackers. This should be just about a sleeve of crackers, but you may need a couple extras. Seems like packages are getting smaller and smaller these days, so have an extra sleeve on hand just in case. Next up, you’ll melt butter in a sauce pan. When the butter is melted, stir in some brown sugar and peanut butter and bring that a full boil. You can stir up until it’s boiling, but once it starts boiling, let it go for 3 minutes without touching it. Very carefully pour that toffee mixture over the crackers. Boiling sugar can really burn you, so be careful here. 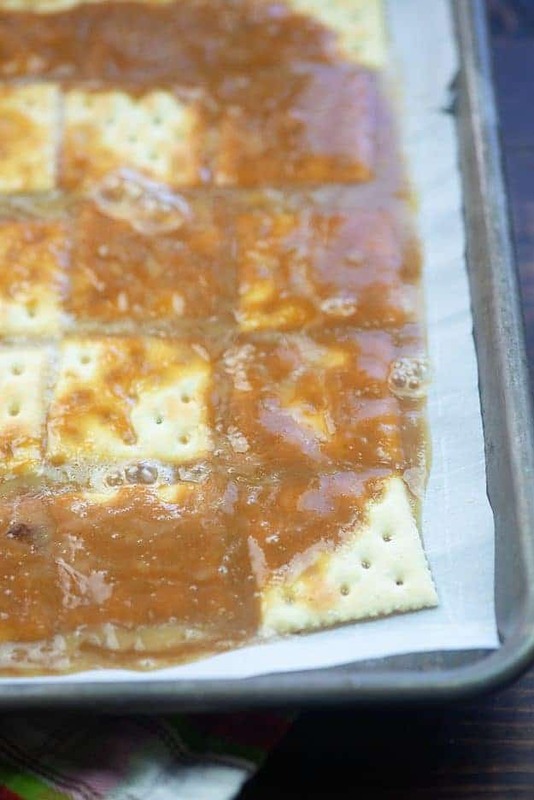 Once your toffee is evenly poured over your crackers, carefully place this in a hot oven for 5 minutes. Remove from the oven and cover with a layer of chocolate chips. Pop it back in the oven for one more minute to melt the chocolate chips. Did you know chocolate chips hold their shape as they melt? Don’t leave them in longer than a minute or they’ll burn. 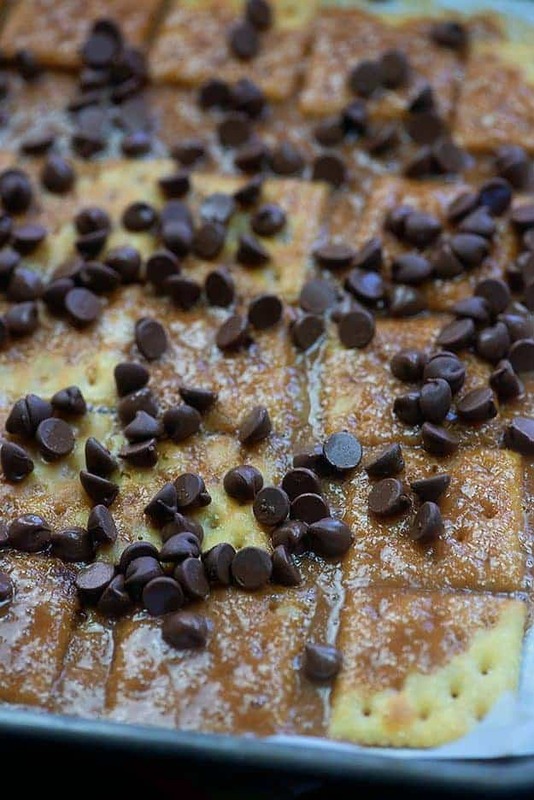 Just pull the pan out and use a butter knife or off-set spatula to smooth the chocolate chips out into a smooth layer. Next comes the red and green m&m’s. I like to pop mine in a baggie and then go at them with a mallet to break them up a bit. I like the way it looks with broken pieces of m&m’s and I prefer smaller pieces on my toffee to whole pieces. You do you, though. 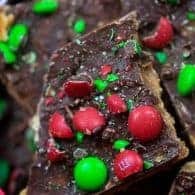 Just sprinkle the candy over the Christmas crack and let it cool on the counter to room temperature and then pop it all in the fridge or freezer to harden up. 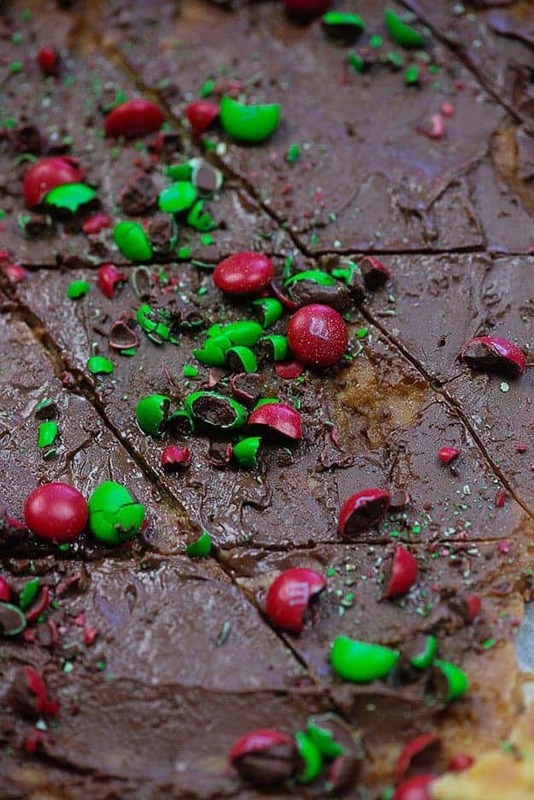 This Christmas crack candy is so easy and only takes about 10 minutes of hands on time. You will need to plan for about 3 hours of chill time, though. So tell me, have you tried this saltine cracker toffee before? Is it a staple on your Christmas baking list too? White Chocolate Chip Cookies: With red and green sprinkles! Chocolate Peanut Butter Fudge: Layers of goodness and it’s made in the microwave! Chocolate Chip Shortbread Cookies: Obsessed. Pecan Pie Cheesecake: Two desserts in one! 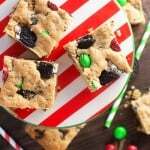 No Bake Cookies: I dressed them up with Christmas sprinkles! 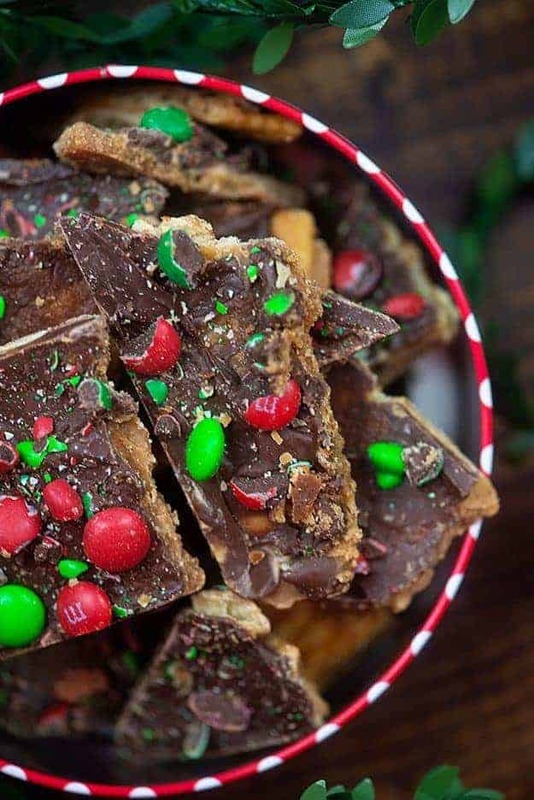 A holiday classic made with saltine crackers, peanut butter, and an easy homemade toffee. Preheat the oven to 400 degrees. Line a 18x13 baking sheet with parchment paper. Place all of the saltines salt side up on the baking sheet in an even layer. Add the sugar, butter, and peanut butter to a medium sauce pan and bring to a boil over medium heat, stirring occasionally. When the mixture is fully boiling, stop stirring and allow to boil for three minutes. Carefully pour the boiling mixture over the crackers and put in the oven for five minutes. Remove from the oven and sprinkle with the chocolate chips. Return to the oven for 1 minute. Spread the chocolate chips out into an even layer and sprinkle the m&ms over the chocolate. Let cool on the counter for about 20 minutes. Place in the freezer for an hour and then break apart into small pieces. 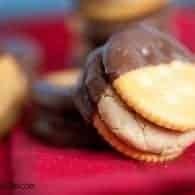 Just toss it in the freezer afterwards and you have a dangerously delicious snack anytime! Yum! Hi, this looks yummy. Do you have to use the peanut butter. My kids are allergic. I love this! You’ve covered all the bases here – sweet, salty, crunchy, smooth! Sounds like heaven! Pinning! My mom and I used to make a similar recipe, minus the peanut butter and M & Ms. Simple and delicious! Mine did not turn out!!!! I am an experienced baker/cook. I don’t know if it’s because I used chunky peanut butty (all I had). The no stirring during the last 3 minutes did not allow my carmel to set up. Also the spreading of the chocolate chips did not work at all. I’m really bummed. Any suggestions? I wouldn’t think the chunky peanut butter would hurt anything. Was the mixture at a good strong boil (not just the edges) for the full 3 minutes? The mixture finishes off in the oven so it would still be liquid when you pour it over the crackers and it’s still liquid when it comes out of the oven. It needs to set for a bit before it hardens. What did your chocolate chips do? If they weren’t melted, perhaps your oven wasn’t hot enough? A minute at 400 degrees after being sprinkled on hot toffee should have melted them, but if not you could pop them back in for another minute. You just don’t want to overdo it because they’ll burn. They should be fine in airtight container for a week or so. Longer than that and I would freeze them. 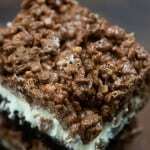 I am thinking about making these on a Saturday and freezing them to serve on Monday. Would they be ok in the freezer or should I freeze for a hour, tear in pieces and put in airtight container and store in fridge? They’ll last just fine in the fridge or freezer. I’d just keep them in the fridge myself since it’s such a short time. I have done something like this but haven’t use the chocolate m&Ms yet. But we do a Christmas party at work and I have told everybody that I am making them for the party and everybody said they can’t wait to try these. So I will let u know how they turn out. I love these little recipe s for a group of friends. They really enjoy them and so does my husband. Could you use coconut instead of peanut butter? I don’t think so, but I’ve never tried it.